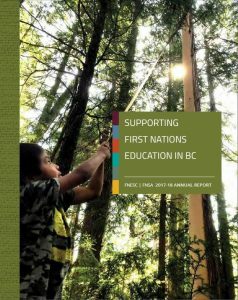 We are very pleased to present the Annual Report of the First Nations Education Steering Committee (FNESC) and the First Nations Schools Association (FNSA). Once again, we are proud to present this report as a collaborative document, reflecting our mutual responsibility for a number of key programs, as well as the common interests and goals of our organizations. Read our Annual Report (2017/2018). For archived annual reports, please visit our publications catalogue.